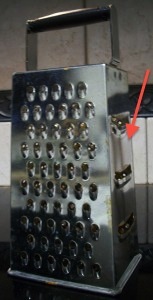 This part of the cheese grater. - Using the the side of your cheese grater, slice sweet potato. This is also really good with a few Oz of ground turkey mixed into the frittata (cook before adding)! This looks amazing! I'm totally making this with Daiya instead of Feta!! !